Step 1: YOU fill out a credit application online with our finance provider, Highlands Financial, by clicking our application or we fax you a credit application (the form usually takes about 5 minutes to fill out). Once we receive the completed application back from you, we often have an answer and terms within a few hours. Step 2: WE handle the paperwork for you, including titling and registering your trailer. You simply sign the required documents. Thanks to email, fax machines, overnight mail and trailer deliver services, you may be able to do all the paperwork without leaving your house. Step 3: YOU drive away pulling your new trailer or your new trailer is delivered to you. You will receive your payment booklet or coupon directly from the lender. Q. What are my options for filling out a credit application? A. With the changes in today's economy and market, more times than not the lenders are requiring a minimum of 10% down on new units, however with excellent credit there are some no-money down programs available. On our used units, a minimum of 10% down is required, regardless of credit, and most lenders want to see 20% down. Q. How large of a loan can I qualify for? A. There are several factors that are going to play into this equation. One is your income and more importantly you debt to income ratio, this is the amount of monthly payments you have to what your income is, then they look at the residual income. Another factor is your credit score and most importantly is what kind of payment are you comfortable with every month. As in the mortgage industry, it may not be a bad idea to fill out a credit application before trailer shopping to get "pre qualified". This may help you to determine the price range of trailers creditors will approve you for. Q. How long of a term can I finance a trailer for? A. The terms will vary depending upon the unit selected, amount you wish to finance and credit profile. 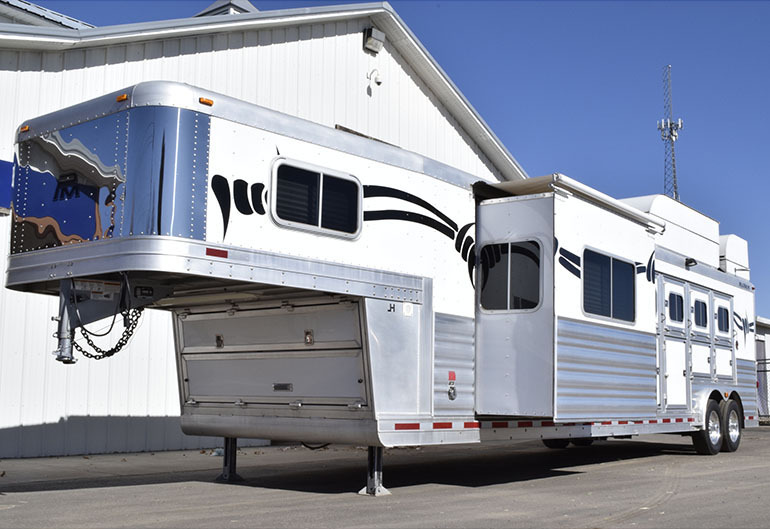 Typically on a New Living Quarters trailer, financing above $25,000.00 you can receive up to a 180 month term (15 years) in some cases extended terms maybe available. On our Non-Living Quarters, goosenecks and bumper pulls, financing over $10,000.00 you can receive up to a 120 month term (10 years) and in some cases extended terms maybe available. Q. Can I use my trade as part of my down payment requirements? A. Yes, in most cases the equity in your trade can be used as a portion or all of your down payment. Equity would be defined as the difference in what we allow on your trade and the payoff of your trade, if any. Q. Can you finance used trailers? A. Yes, we can finance used trailers, however there are a few exceptions on this. Some of our used trailers may not meet the age requirements, a trailer "normally" must be less than 10 years old to be financed but there are a few exceptions to this rule. Titling requirements may also hold back the acceptability of a used unit for financing. Please contact one of our sales associates, if you have any questions on a particular unit. Q. Which is easier to finance New or Used trailers? A. It is always easier to finance a New Unit, because the lender has less risk in the collateral package securing the loan. Q. What kind of interest rates might I expect? A. Rates will vary widely depending upon the age of the trailer being financed and your individual credit history. It has become harder to get financing and interest rates have gone up as well. New trailers do qualify for slightly lower interest rates than used trailers (trailers that have been previously titled) and we also see more competitive rates when larger amounts are financed (amounts over $25,000). Interest rates range anywhere from 4.5% up to 19.99%. On a new living quarter trailer, financing over $25,000, and with excellent credit, you could expect approximately 4 .5%-10.99%. Q. What type of credit do the lenders require? A. Typically a minimum of 620 credit score is needed to be considered for financing. Other factors will be assessed in the overall decision, such as debt to income ratio, amount of revolving debt, collections, judgments and other public records. Another item is the length of time and amounts of credit you have borrowed in the past. The final approval, rate and term will be made solely by that lending institution itself. Q. What if I had a Bankruptcy? A. Typically it is a minimum of 3-years from the discharge date before they will consider financing a trailer. At that point they will look at credit history since and re-establishment within that time frame. Q. Do the lenders require any additional documents for approval? A. In some cases W-2’s, pay stubs or tax returns maybe required to verify income. Q. If i do not qualify for financing with one of yoru companies or I choose to use my own bank, is that allowed? A. Yes, we will work with your outside financing. However, we do require that full payment has been made or funding arrangements prior to the unit leaving our lot. Proof of insurance will also be required. Q. Once I am approved, what documents do you require to finalize the loan? A. Upon approval, we will require a copy of all applicants’ drivers’ license and a proof of full coverage insurance with a minimum of $1000.00 deductible and appropriate lien holder information. Q. Tax, Title, and License (TT&L)??? A. This seems to be one of the more confusing issues when purchasing a trailer. Many customers outside of Texas are concerned that we charge a Texas sales tax on top of their own state tax. This is never the case. You only have to pay the sales tax, title, and licensing fee from the state you live in. If you live in another state other than Texas and we provide financing for your trailer, our lenders require us to collect the TT&L from your state and pay your local Department of Motor Vehicle. If you live outside of the state of Texas and have arranged your own financing or are paying "cash" for your trailer, we DO NOT collect any taxes. You will be responsible for paying your state tax, title, and license when you register your trailer. If you are a Texas resident, we are required by law, to collect all applicable tax, title, and license fees and forward them on to the state of Texas. We will also mail your license plate and registration to you. Each state charges different tax rates and can even vary within the counties of the state. This normally ranges from 3.0% to 8.5% of the purchase price. Each state also has unique laws regarding trade ins. Most states will only charge sales tax on the "difference" of the price (your new trailer cost $50,000, your trade in trailer is worth $20,000, $30,000 is the difference). However, there are a few states that will not allow credit of your trade in and charge tax on the full purchase price. Your local Department of Motor Vehicle will be your best source of information on these laws. For further information or details on trailer TT&L's, email Trailer Sales or call us at 800-749-0522.